Top 6 Best Collapsible Dog Bowls For Travel — Stackable, Foldable, etc. 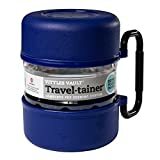 Nylon vs silicone vs stainless steel travel dog bowls? 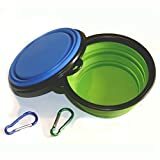 Which Collapsible Dog Travel Bowl To Buy? 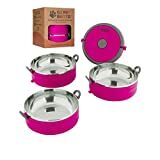 Owing a couple of the best collapsible dog bowls or more regular dog travel bowls is a must once you get on the road with your pet. Dog shows are another place where the handlers all have their favorite lucky collapsible dog bowls. 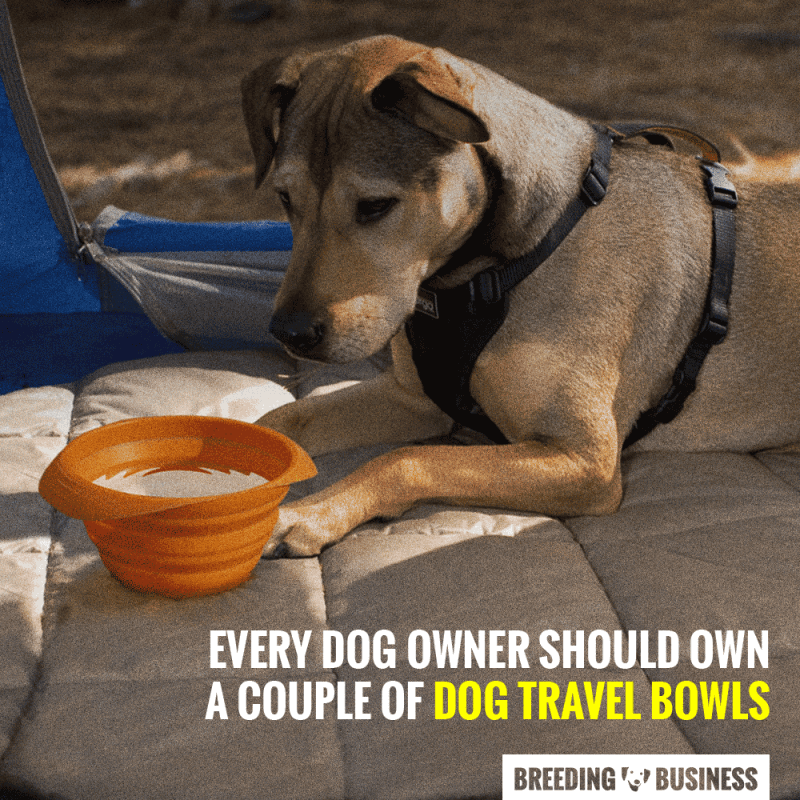 This is exactly why I have a list of the top 6 best collapsible dog travel bowls that can fit into your backpack or car’s glove compartment. 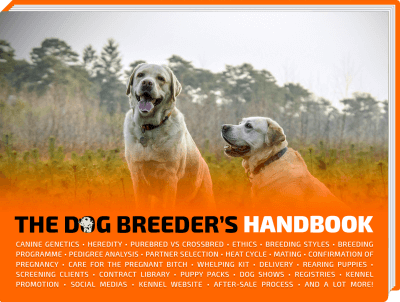 First, let’s take a look at the main features to consider when deciding on what is the right travel bowl for your dog. 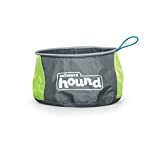 Collapsible dog bowls are amazing when you’re taking your dog along with you for a long road trip or out on vacations. Many dog handlers will use these travel dog bowls at dog shows, too. And you have a few dog owners who went even beyond that, and decided to use them at home. Compact — These bowls are collapsible which turn them out to be really small and compact. 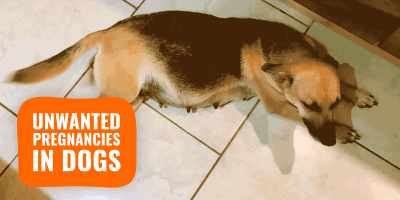 This means that if you’re travelling and have space restrictions, you don’t have to worry about a bulky dog bowl! Such compact format doesn’t make them less useful at all in comparison to regular dog bowls. Easy to Carry Everywhere — This goes hand-in-hand with the previous point. Since the bowl is compact, you can carry it everywhere because of its light weight. So, it will fit your backpack, your car’s glove compartment, etc… Your doggy will always stay hydrated, wherever you go. 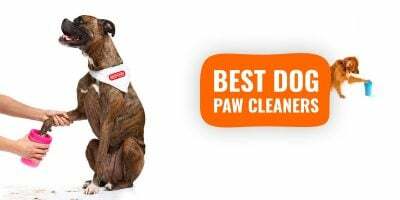 Easy to Clean and Fast Drying — These dog bowls are super easy to clean as most of them can fold flat so that you reach every nook and cranny. And since these bowls are made of silicone-like materials or metal, they dry very quickly and easily — especially during the summer time. Available In Different Sizes — Travel dog bowls come in all shapes and sizes that’ll meet your dog’s needs when you’re out and about on an adventure. Can be Used for Outdoor Training — It is really important to train your doggy outdoors for their own safety. This is because puppies don’t obey commands when there is too much stimulation, so you have to teach them. These collapsible dog travel bowls come in handy when you’re training your puppy outdoors and helps keep your furry companion stay hydrated! 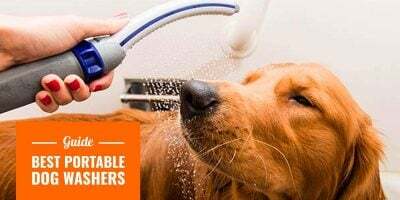 Stainless steel and silicone are more hygienic for anything wet such as canned dog food, or water. 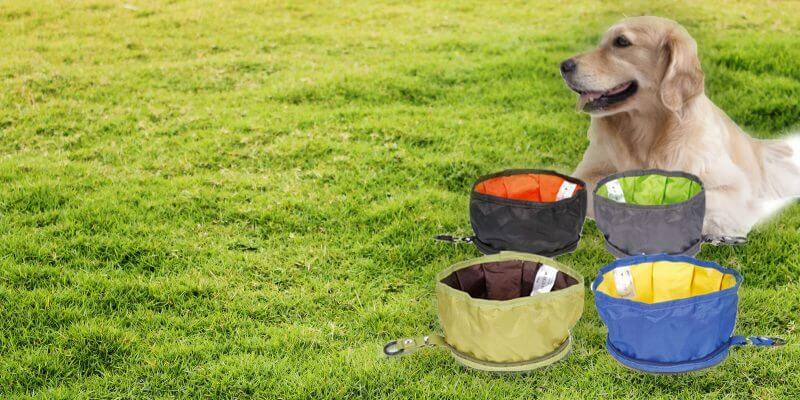 Most collapsible travel dog bowls are either made of some sort of water-resistant fabric, silicone, or metal. Each material has its pros and cons but you can always have a couple of different ones. Travel dog bowls are generally cheap! Nylon-based fabric is great because it is soft therefore very easy to store. However, using a nylon collapsible dog bowl as a water bowl may be a bit of a gamble. Despite being somewhat waterproofed during the manufacturing process, they tend to absorb some water if you leave the liquid in it for several minutes. Additionally, nylon or any fabric for that matter, can tear or become fragile at the seams after months of intense use. Silicone and soft plastic travel dog bowls are more versatile but do take a little more room. They can still be collapsible so you do want, in that case, a product that can fold flat. They are way much easier to clean in comparison to fabric-based collapsible dog bowls. Stainless steel travel dog bowls are to me the least travel-friendly dog bowls but they are extremely easy to clean and do prevent bacteria from spreading fast. That can be useful for longer trips for example. Because they are made of metal, they aren’t able to be collapsible or foldable, but you find them generally stackable. It is up to you whether you favor packability or versatility. Wet food should only be served in a stainless steel travel bowl for hygiene. You can absolutely also buy one nylon dog bowl for dry dog food and a silicone or metal one for water. Portable dog bowls are useful during dog shows, when camping, or on the road. Before I talk about all of these amazing collapsible bowls in detail, I would like to make things easier for you by reviewing each of these collapsible bowls in a brief manner. Straight to the point: what’s good and what’s bad for each of them. What I like about this dog bowl is that you can tuck it into your bag, purse, or even your pocket! Other than that, I really like how this bowl folds flat which makes it easy to clean and dry. This lightweight dog travel bowl doesn’t leak as much as others made of nylon do. However, there are a few cons as well. Although this bowl is great for food, it has issues with holding water as it tends to leak and leave a puddle of water if you leave water in it for too long. There have been issues with the elastic loop as well as it tends to break off. However, these may have been one-off bad experiences handled by the customer service after review. Outward Hound is a very reputable brand. All in all, I feel that this dog bowl is great for food if you own a small breed dog. I really like how lightweight and compatible it is. Perhaps not the best option for as a travel water bowl or for big kibble. The Comsun Collapsible Dog Bowl is made of food-grade silicone and comes in a single size 5.1″ wide and 2.1″ tall. This dog bowl can hold up to 1.5 cups of dog food or water. Made of safe materials, the bowl is 100% BPA-free, lead-free, and is also FDA-approved—so you don’t have to worry about your furry friend! What I like about this bowl is that it is durable and easy to clean! All you need to do is rinse this under some water and you’re good to go. However, there are a few things that I didn’t like. This bowl does not come with a top lid which could be handy when you’re out and about. Made of silicone, this bowl is prone to tearing when not handled correctly. Finally, if you don’t wash it correctly, this bowl can develop moulds! I feel that this is a decent bowl for the price but, you have to take care of it in order to keep it in its best condition. The size of each individual bowl is the same, but their number varies. I like the fact that these stackable dog bowls are eco-friendly and are free from harmful substances. These bowls are dishwasher-safe and great for carrying food as well as water. The top bowl can hold up to 16 oz water and the bottom one can hold 20 oz of dry food. However… the latches and handles of the bowls are made of plastic and can break easily. Another thing is that the bowl is prone to leaking when not on a flat surface and, finally, these bowls aren’t as good for larger breed dogs. I feel that the healthy human stainless steel bowls are a good option if you have a small breed dog or are going on a road trip with your dog! The Sunny Beginning Pet Bowls come in a set of two nylon bowls. 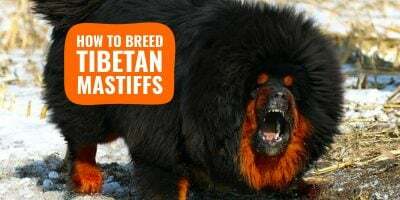 They are both of the same size — 6.5 inch in diameter and 2.5 inches deep which is good enough to store 4 cups of food or water. These waterproof bowls are easy to clean and can be washed in the washing machine and then air dried. These bowls also collapse flat so they can fit into your car’s glove compartment (or your bag) easily! There are a few cons as well with the Sunny Beginning Pet Bowls. First off, these can be too thin and thus leak when you put water in them for a long duration. The waterproof lining is also prone to tearing in a short period of time and the hook is not included. Definitely not good for aggressive chewers who will consider these bowls as chew toys! All in all, the sunny beginning pet bowls are nice for short road trips and limited uses. I really like how you can wash these in the washing machine. The Alfie Collapsible Pet Bowl is another good option. The nylon bowl in 8″ in diameter and 4″ in height — it folds to under 1″ thin so it is very convenient to carry — especially when you have space restrictions! This collapsible dog bowl is amazing for small or medium-sized breeds and it can fold flat making it easier to clean. Another thing I like is that the interior of this bowl has a waterproof lining and also has a strong hold. 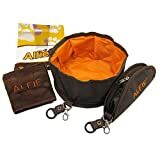 The Alfie Collapsible Pet Bowl is a great option if you have a small breed dog and are using it for food. This is the final bowl on my list and some dog owners would argue, this is also the best dog travel bowl! This three-piece storage travel container is made of high-density Polyethylene and is 7.5″ tall. Free from BPA and FDA approved, this airtight bowl helps you keep your dog’s food fresh and helps retain its flavour. I like how you can spin on and off the lid. The compact design helps portion meals out and the bowl is constructed to be sturdy. I feel that this one is an amazing companion! The plastic handles on it aren’t hard-duty but should not break so easily. Another thing is that the bowls are not dishwasher safe and the bowls aren’t big enough for large breed dogs. All in all, this is a good choice if you own a small breed dog and want to keep your pet’s food fresh! Still confused? Do you think I’ve left out a good travel bowl? Let me know in the comments section! Thanks to Marina for helping with this article. Marina is a 20-something college student who is a self-proclaimed dog-a-holic. She’s currently pursuing her master’s degree and writes a blog named PetDt. She plans on opening a dog shelter one day.